Veronica Guerin tells the true story of an intrepid journalist who provokes Dublin’s drug lords and becomes a pivotal figure in recent Irish history. Veronica Guerin follows a newspaper writer as she traces the money and uncovers Dublin’s drug trade in the mid 1990s, a time when the kingpins and cops allowed the slums to deteriorate into lawless pits, the streets littered with needles and the youngest children mimicking shooting up. This film may not be seen by many, but it’s the only chronicle we have of an important moment in history, one of those moments about which the Irish ask each other, “Where were you when you heard the news?” as we do in the U.S. with the Challenger disaster. On this account alone it deserves a viewing. As an entertainment, it’s less successful. Blanchette, eyes a-batting, tilts at Guerin’s windmills, the bad guys responsible for hooking 14,000 of her Dublin neighbors – including children – on heroin. 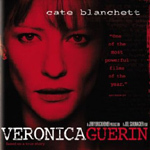 Despite its careful representation of the journalist’s true-life quest, Veronica Guerin winds up looking like another movie that depends on its protagonist to brazen her way into countless situations when anyone else would call for backup – or at least bring a photographer along. With its chorus of reasonable family and colleagues justifiably intimidated by the drug lords’ threats, this film makes it all too easy to condescend to Guerin as she steps across the thresholds of journalistic integrity and good sense in her headlong pursuit of the bad guys. The film contains some profanity, drug use, and numerous episodes of disturbing violence. Yet despite the distressing subject I am glad for the introduction to the woman Veronica Guerin, a writer absolutely committed to uncovering a brutal disregard for human life that everyone else was willing to tolerate.